The pantheon of Greek gods traditionally includes twelve Olympians, all the heavy-hitters we all know and love: immortals like Zeus, Athena, Ares, and Aphrodite. 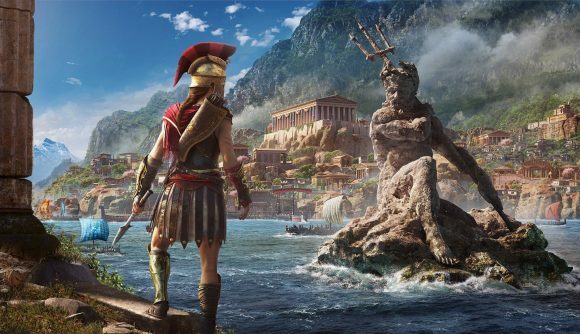 But someone thinks they’ve found one of the lesser-appreciated gods hidden away in a cave in Assassin’s Creed Odyssey. A redditor who goes by TheMadTemplar says they found a cave tucked away on the northern edge of Odyssey’s expansive map, in the sparsely-inhabited Malis region, where Leonidas is rumored to have fought Xerxes unstoppable Persian army to a standstill. There, they found a cave that is only accessible via a squeeze-through crack in the rock. Inside, TheMadTemplar says they found Isu architecture, and in a back chamber, a lone blacksmith working on a forge built into the Isu-carved rocks. There’s no other entrance to the cave, and TheMadTemplar says it’s impossible for the blacksmith to have gotten his equipment through the narrow gap you have to pass through to access the area. That led TheMadTemplar to conclude that the blacksmith is Hephaestus, the Greek god of fire, forges, and sculpture, among other things. He was one of Zeus’ children, and married to Aphrodite, but is known as the only ugly god in the Greek pantheon. Other redditors in the thread have reported finding the same cave and being confused why a blacksmith would be found so far from the nearest settlement – there’s a fort 400 meters away and a village 600 meters away, but otherwise, the area is wilderness. As redditor richard0copeland points out, it would be pretty great if Assassin’s Creed Odyssey had hidden all of the “big 12” around the gameworld, quietly doing their things and passing as mortals, waiting for us to find them.